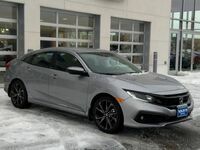 The beautiful exterior styling of the 2019 Honda Civic Sedan begins with its sporty front grille with wideset headlights and its beveled hood while sleek body panels give the 2019 Civic Sedan with a long and lean profile appearance. With five trim levels to choose from and eight exterior color choices the 2019 Honda Civic Sedan can be completely customized to meet your personal style and taste. You can learn more about all of the trim levels for the 2019 Honda Civic Sedan below and you can find the 2019 Civic Sedan waiting for you at Van’s Honda in Green Bay, WI today. 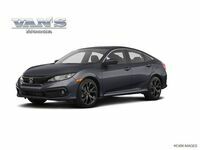 What are the Standard & Available Features of the 2019 Honda Civic Sedan? Standard interior features found within the 2019 Honda Civic Sedan include a 5” LCD screen with Bluetooth® connectivity and a 4-speaker stereo. Upgrade beyond the base trim level of the 2019 Civic Sedan and owners are rewarded with a 7” High-Resolution Touchscreen Display with Apple CarPlay™, Android Auto™, and HondaLink®. Inside the cabin of the 2019 Honda Civic Sedan Touring trim you will find the Honda Satellite-Linked Navigation System™, a 450-Watt 10-Speaker Stereo with Subwoofer, Leather-Trimmed Seats, Heated Front & Rear Outboard Seats, and Power-Adjusting Driver & Front Passenger Seat. 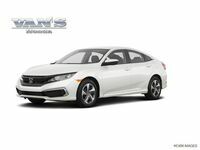 You can take the 2019 Honda Civic Sedan for a test drive today at Van’s Honda to experience everything it has to offer firsthand and figure out which trim level is right for you.